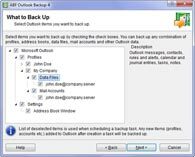 Outlook Backup is a program to backup Microsoft Outlook email client. The program enables you to back up Outlook email messages, contacts, settings and other important data. Outlook Backup is compatible with all versions of Microsoft Outlook. ABF Outlook Backup is the world's most popular program to backup Microsoft Outlook mail client. This handy software enables you to make backup of Outlook data fast, easily and fully secure. And if a disaster happens you'll get all your data back in flash. ABF Outlook Backup (hereinafter "Outlook Backup") saves and restores Outlook email messages and folders, address book contacts, calendars, journals, tasks, notes, mail accounts, message rules, junk email lists, settings and signatures. And all that is done just in a couple of clicks! Why do I need to backup Outlook? In the modern IT world emails are our lifeline. The thought about losing all Outlook correspondence and contacts due to unexpected hardware malfunctions, software failures or viruses sounds really scary. And Outlook Backup will be the only way to restore your Outlook after crash. Outlook Backup enables you to backup directly to an external hard drive, flash drive, removable device or any other remote storage. You can burn your backup file to CD or DVD using the program's internal CD/DVD burner. Moving and synchronizing Outlook data between several computer users or operating systems haven't ever been as simple as it is with Outlook Backup. And backup or restore scheduler will help to automate the Outlook synchronization process. We have been making backup solutions since 2002. Beginning from that time we have had about 25000+ satisfied customers, none of which have ever had any data loss problems. So you can be sure your data will be 100% safe with our software.